Holiday houses with tennis court 5 of the best, selected by us for you from our unbeatable range of 37 villas with private tennis courts and pools. We are very proud to have such a fantastic range of properties with their own tennis facilities in the grounds. Many are firm favourites with our clients some of whom have returned five years consecutively for their main family holiday. It is from previous client recommendations that we have drawn up our short list of five of the best to help you choose the right villa, chateau, manor or cottage for you. The first place goes to the VID24 La Chatronnie in the Dordogne, France, which tops a number of our recommended lists due its first rate facilities. The tennis court is a quick surface and has floodlights so you can enjoy playing in the evening. Many clients are on the villas private golf course by day. The GC46 Les Calpres, also in the Dordogne, takes second place as much for the overall charm of this beautiful chateau as the tennis court which is very well appointed down the hill away from the house. The B315 Les Freysseix, again in the Dordogne, is a very popular manor house which is often taken for multi generational holidays with the grandparents frequently footing the bill. The large grounds, pool and tennis court are the main attraction. The GUT1601 Casanova in Tuscany, Italy is another large property which attracts multi generational holiday groups. Again the tennis court is set well away from the villa, just below the pool area, so the noise doesn’t disturb those relaxing in the villa. Finally it’s the SOLA24 Proche Cabris in Saint Cezaire sur Siagne in the Cote d’Azur, France, which is a family size villa sleeping 6. 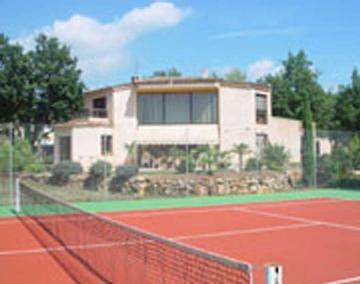 The tennis court is in excellent condition and there is a beautiful pool area. The nearby village is really super as is the surrounding area. We are constantly adding new villas with tennis courts such as the RES1401 Castello di Corte which came on stream only yesterday. 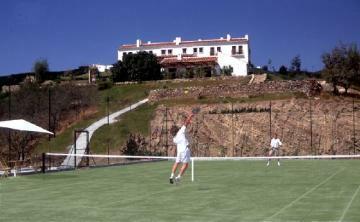 Villas with tennis courts are a specialty which we will continue to develop.